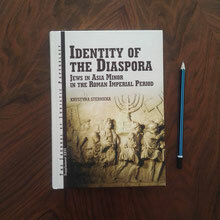 Review of: Krystyna Stebnicka: Identity of the Diaspora. Jews in Asia Minor in the Roman Imperial Period. Warschau: University of Warsaw, Faculty of Law and Administration, Chair of Roman Law and the Law of Antiquity 2015 (The Journal of Juristic Papyrology. Supplement 26).